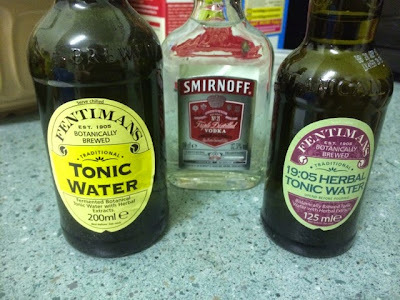 A while back I reviewed the original Fentimans tonic water. It was interesting, but not my favourite tonic, nor my favourite Fentimans. I was contacted about a new drink in the range and sent a bottle to try. The first thing to note is the tiny portion. 125 ml of tonic doesn't go very far, I'm more a fan of bottles of the stuff and have been known to order pints. This did however suggest that it was again intended as a mixer so I made a special trip out and got a bottle of vodka. 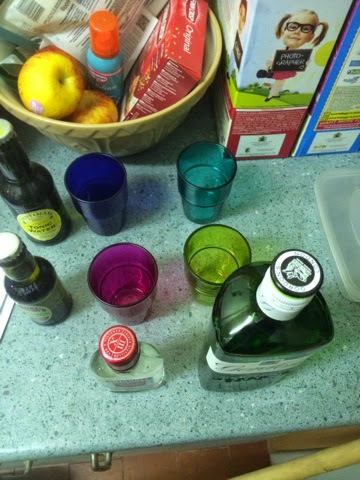 I found one of my partners bottles of gin out of the cupboard (we tend to get it for parties and not finish it) and set up a lovely grid arrangement of the two types of tonic and the two alcohols - Smirnoff a vodka and Gordon's Gin. I mainly focused on the vodka pair and my partner the gin - although not being a fan of tonic she didn't try much at all! The vodka and original Fentimans tonic was as I remembered it. I think I was a little heavy handed with the alcohol and the flavours were initially tipped a bit that way. In contrast the 17:05 tonic was much more floral and uplifting. The vodka again was very present throughout the flavour, but the tonic changed with it instead of been a single flat taste. Of the four drinks this mix was my favourite, and something I could certainly drink again. The original tonic with gin was also as I remember it - and even though I like vodka more, I prefer this to the vodka/original. The reason I had a bottle of the original tonic still floating around was to use with the gin. The herbal flavours of the 17:05 tonic again complemented the gin really nicely. While I would say I also preferred this mix to the yellow/gin mix I'd say the difference is less pronounced than the vodka was. I was a little disappointed with the original yellow label tonic that Fentimans produced. It wasn't as strong as fever tree and wasn't as interesting as their other drinks. The 17:05 bucks that trend and is a very it interesting drink indeed. The only real complaint I had is that one bottle didn't give me enough of a sample to try much without alcohol. I will certainly buy more to find out.